In an ominous development, the PSNI police have refused to guarantee the safety of the parade participants. It also refused to give an unconditional undertaking to uphold the Parades’s Commission determination to allow the civil rights march to go ahead. Hundreds of loyalists have been granted permission to hold a protest as the march makes its way into Belfast city centre. The march, organised by the Anti-Internment League, marks the 1971 introduction of internment without trial. It will demonstrate against the ongoing use of ‘internment by remand’ to summarily imprison prominent republicans. Up to 4,000 people and 12 bands are set to take part. Unionists and loyalists are again mobilising to block the annual parade near Royal Avenue, where a loyalist riot successfully blocked the parade last year. Thousands of leaflets and posters have been distributed across Protestant areas of the Six Counties this week, calling on unionists to stop the event. 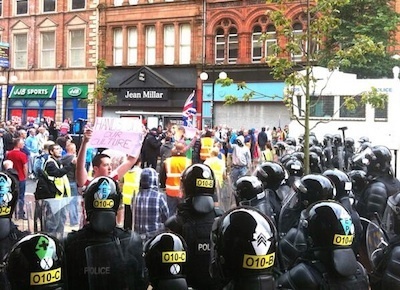 On Friday, a High Court judge rejected a last-minute legal bid to reduce the number of loyalist protesters. Anti-Internment League spokesman Dee Fennell said the onus was now on the PSNI to ensure that the Parades Commission ruling is “upheld in the same way” as it was for the Orange Order’s July 12 parade through Ardoyne in north Belfast. Loyalist victims’ campaigner Willie Frazer said he will be attending the protest, and warned that the civil rights parade might prove “provocative”. “People are not happy and not only about this parade, there are a lot of things building up in the community and I hope the anger does not come out on the day,” he said. There are also tensions this weekend over parades organised by the Apprentice Boys of Derry, particularly in north Belfast, where a feeder parade will pass through the flashpoint Carrick Hill area. Last weekend, Sinn Fein’s annual hunger strike commemoration passed off without incident in Derrylin, County Fermanagh, despite a loyalist protest. The Parades Commission had placed a number of restrictions on Sinn Fein including the banning of military clothing and flags or banners containing IRA symbols. But unionist warnings of repercussions over the decision to reroute an Orange Order parade away from the nationalist Ardoyne last month have continued throughout the marching season. In her speech at Derrylin, Sinn Fein’s Michelle Gildernew touched on the failure to deal with the issue of parades as well as the other ongoing issues. She said “the events of recent months and in particular the coalescing of political unionism around negative and an anti-agreement position should come as no surprise”. She warned British Direct Ruler Theresa Villiers “has also pandered to political unionism and undermined the political process”. That theme was repeated by Gerry Adams this week when he warned that the political process “faces its greatest challenge” since the 1998 Good Friday agreement. Referring to the approaching 20th anniversary of the 1994 IRA ceasefire, Adams said he was not hopeful that a fresh round of all-party talks next month could resolve the outstanding issues. “There is no evidence from [the British government] or the Unionist leaderships of any likelihood of a real negotiation on all of these issues commencing in September,” he said. He also criticised reports that Villiers could concede to another of the recent unionist demands by setting up some form of inquiry into the Parades Commission decision on the Ardoyne march. “The anti-Good Friday Agreement axis within unionism, the pro-unionist stance of the British secretary of state, the refusal of Downing St to honour its own obligations, and its efforts to impose cuts in the welfare system, are combining to create the most serious threat to the political institutions in the north in recent years,” he said. Meanwhile, there were clashes in west Belfast on Thursday morning and a petrol bomb was thrown as bonfires were being erected by nationalist youths to mark the introduction of internment without trial. The PSNI’s specialist tactical support group moved in to effect the removal of bonfire material from a site in the Cullingtree Road area of Divis. Two teenagers were arrested as other youths moved the remaining bonfire material to a different location, near Townsend Street. Nationalist residents groups have expressed opposition to the bonfires, particularly in Divis due to its proximity to the high-rise Divis flats and the anti-social activities of a gang known as the ‘Divis hoods’. Youths in other deprived nationalist areas such as Beechmount and New Lodge have also controversially continued the tradition as a recreational outlet, and as a form of political protest, often mirroring some of the sectarian aspects of the loyalist bonfires, such as the burning of British flags. Sinn Fein has strongly opposed all of the internment bonfires. West Belfast representative Fra McCann particularly condemned threats which were made to council staff who removed items from the Divis bonfire.